Starring Wallace Beery, Lewis Stone, Johnny Mack Brown, Jean Harlow, Marjorie Rambeau, Paul Hurst, Clark Gable, Ralph Bellamy, John Miljan. For a Metro picture, The Secret Six is unusually gritty. Hulking Louis Scorpio (Wallace Beery) works for a living killing cows in the Chicago stockyards. He's recruited into the bootlegging gang of the refined Newton (Lewis Stone) by two of his lieutenants, the slick-talking Johnny Franks (Ralph Bellamy) and the less aggressive Nick the Gouger (Paul Hurst). At first Scorpio is just a strong-arm artist, helping Johnny and Nick push Newton's booze into the neighboring territory of Joe Colimo (John Miljan). Colimo tries to keep his younger brother Ivan (Oscar Rudolph) out of the business, but the nervy kid gets killed in a scuffle with Newton's bunch. The treacherous Johnny sets up Scorpio to take the blame, and the big man is wounded by one of Colimo's men. Not only does Scorpio even the score, he moves up in the rackets, acquiring on the way Anne Courtland (Jean Harlow) one of Newton's girls. Reporters Hank and Carl (John Mack Brown & Clark Gable) are both sweet on Anne as well, and Scorpio encourages the relationship to put the reporters off the trail of his newest schemes, like running Nick for the office of Mayor. Then a special crime commission is convened, with six officials wearing hoods for anonymity as they investigate racketeering in the city. Scorpio is put on trial after one of his own men testifies against him. Already Hank is marked for death, which terrifies Anne. And Scorpio is convinced he can escape justice by bribing the jury. 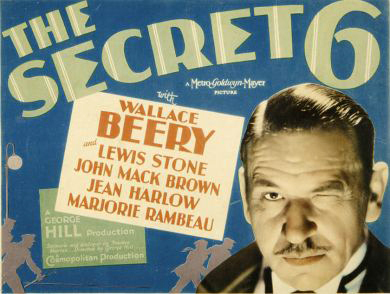 A full-blown gangland saga with perhaps a bit too much happening between too many characters, The Secret Six suffers somewhat from having Wallace Beery as its central gangster figure. The goonish Beery is more jovial than threatening, and he never seems sufficiently intelligent to tie his shoes, let alone outsmart his fellow gangsters and lawmen. We're told that Harlow and Gable's roles were enlarged as the film progressed, when Irving Thalberg saw how well they came off on screen. Harlow seems more self-assured than in earlier appearances. Gable already has much of his winning screen persona in place. As a springboard film couple they are certainly worth watching. George (W.) Hill had a semi-independent producing and directing at MGM, with his prison picture The Big House already a hit for the popular Wallace Beery. Veteran screenwriter Frances Marion was Hill's spouse and collaborator at the time. The eventful screenplay bogs down in incident, and doesn't have its feet as firmly planted in reality as do Warners pictures of the time. Having Scorpio come from the stockyards seems a slur on honest laborers, as gangland thugs were generally slackers unwilling to do a good day's work. And somebody decided that the big boss would be a gentlemanly upper-class type, playable by the aristocratic Lewis Stone. Stone's Newton doesn't seem tough enough to stay on top. By far the most interesting portrayal is Ralph Bellamy's Johnny Franks. The sociopath Franks is a real departure for Bellamy, a specialist in mellow nice guys that always loses the girl for being too much of a square peg. When the wild-eyed Franks makes an early exit, we miss him. Other Pre-code movies centered on reporters in a gangland environment -- Picture Snatcher, Blessed Event. The Secret Six shoehorns in a journalism ethics sidebar with reporters Hank and Carl, without really following through. Also jammed in, possibly as an afterthought, is the idea of the secret investigators that provides the film with its title. They manage to get Scorpio into a courtroom, and are no longer mentioned. That's all we need, clandestine police units to quietly enforce laws behind closed doors. The movie never forms an opinion about what made Chicago such a lawless city. MGM won't come right out and say that the police force was on the take, so no civic issues are really addressed. Rather than go Warners' route, making Pre-code movies that questioned corruption and injustice, MGM opted for radical endorsements of vigilantism. In Beast of the City, lawman Walter Huston simply provokes a mutually annihilating gun battle with the gangsters. The most extreme response is Gabriel over the White House, in which a dictatorial President of the United States orders the army to arrest an Al Capone figure and execute him in a military court. In The Secret Six the underworld collapses under its own stupidity. One of Scorpio's beer-making workers turns out to only have pretended to be a deaf-mute, and testifies against him. Scorpio's attempts to influence the press don't pan out, and he is later betrayed by Newton's faithful moll Peaches (Marjorie Rambeau). In a way all of the early '30s gangster classics were behind the times, as their stories of ill-gotten riches from the mean streets of the big city could have taken place in 1900. By the waning days of prohibition "the underworld" was already evolving into far more pernicious crime syndicates organized like major businesses. Its leaders no longer flaunted their riches in public. George Hill directs The Secret Six at a brisk pace but with a lack of emphasis on important story points -- the tale just unwinds instead of building to a dramatic climax. The real enjoyment is to be had watching the alluring Jean Harlow and the charming Clark Gable in the most important 'audition' film of their careers. They do indeed have a special spark going. 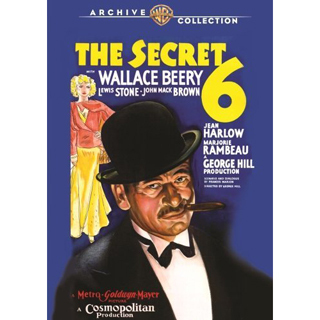 The Warner Archive Collection DVD-R of The Secret Six is a very special title. WAC exec George Feltenstein explained that the only surviving pre-print materials for it, Hold Your Man and Red Dust were simply too damaged to directly remaster. The WB Motion Picture Imaging department worked on all three, finally making releases possible. I've already praised the huge improvement in Red Dust, and The Secret Six has likewise been given a new lease on life. The movie is clean and stable, with an excellent grayscale and no excess of duplicate grain. The audio is excellent. This is one MGM title that rarely showed up on TV, probably because of the lack of attractive prints.